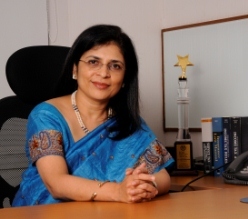 Vibha Padalkar is Executive Director and Chief Financial Officer at HDFC Life, one of India’s leading life insurance providers and currently the only female CFO in the private life insurance industry. After graduating from LSBU, she started work as an apprentice with Cohen Arnold, an Anglo-Jewish audit firm but it was a visit to India in 1993 which led to relocation to the country thanks to its growing economy. Vibha joined HDFC Life in August 2008 following a seven year stint as Executive Vice President-Finance at WNS Global Services; a NYSE listed leading global business process outsourcing company. Vibha's key achievement during her tenure at WNS was to lead a team that successfully completed the Group's IPO on the New York Stock Exchange in a short span of six months.